The narrow entrance hall where it opens into the main river hall. Double doors of three panels each give into a secondary hail, the latter leading to the spacious hail of great length which parallels the house from end to end, and is very uncommon regarding a number of features. The narrow passageway in the centre of the house has shallow pediments above the doorways, but its main mission is to connect the two fronts of the house without attempting beauty, but in a perfectly practical way. There is no door between the two halls, simply an opening, very tall, but not wide, with a leaded glass transom within the frame. The long hall is most impressive. 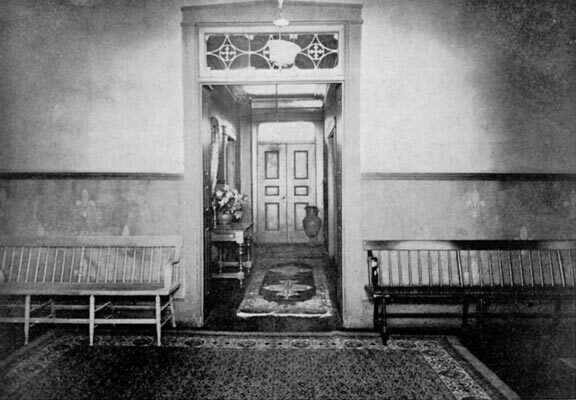 The walls are plastered and papered in a monotone, and there is a chair rail extending around them which is almost twice the height of those popularly used. The plain sides of the door frames are absorbed at the foot by the deep baseboard, and inside windows in curious fashion penetrate the inner wall between the hail and the room beyond. The rest of the windows overlook the river and between them is a doorway through which a charming vista can be obtained. The inner blinds of the windows are plainly panelled while the jambs and cap pieces show the same treatment. The window and door heads maintain in the hail the same pediment shape crudely executed. Two Windsor benches quite properly are all needed as furnishing. The long, wide hall presents the unusual spectacle of two stairways rising within a few feet of each other-as Colonial measurements were counted. Everywhere Rosegill was planned for ease and comfort and never more so than here, where Ralph Wormeley justified them in the consideration shown to his guests and employees. The great length of the hail was the unique excuse for the two stairways, both of walnut in its natural colour and both following the same design. Plain round hand rails begin at the turned newels which appear to have been made at a later day, and two square spindles stand triangularly on each step. The stringer runs below the stair brackets which are carved with a Vitruvian scroll. The ball cornice is partly moulded and partly plain. The music room is crossed in reaching the parlour, which has beautifully panelled walls, supposedly of black walnut, grained. The panels are remarkably broad, the stiles very narrow and, in the space formed by the chimney breast, low seats are below the wainscot where the dado cap is carried along, not continuously, but is mitred against the wall, door and window casings. The firebreast attains an effect of formality by the pilasters fluted of shaft beneath provincial Ionic capitals. The plain frieze between the moulding above the fluting and the cap is seldom seen in the Colonial architecture of Virginia. The cornice of the parlour is one of the best to be found in the Colonies of any date, and the dentils with which it is decorated are of the best workmanship. The lower part dropping to stand upon the pilaster caps makes the cornice very high where it breaks out, but where it extends around the ceiling its depth is only from the denticulated course to the ceiling. One wide rectangular panel fills the area between the pilasters. Unfortunately, both the hearth and the fireplace facing are modern, the first being large, contrasting tiles, and the other brick laid in headers and stretchers. The architrave is white Italian marble and a vivid note of colour is added to the rather sombre room by two blocks of orange Sienna marble set into the white marble frieze below the shelf. Three windows on the landward front have, below cap pieces, inner blinds and panelled jambs, delightfully comfortable seats, which are twenty inches deep and seem very near the floor. The drawing room measures twenty-four b twenty-seven feet, and the ceilings, like those of all the first storey, are eleven feet high. 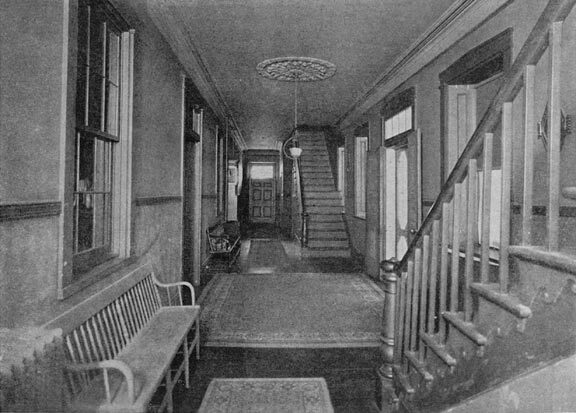 The smoking or "Little Room" across the hall is rendered unique by two inside windows which open into the long hail and here one finds again deeply recessed seats and inner window blinds. Here, too, is an open fireplace, upon the modern mantel of which stand serried rows of silver loving cups which would have delighted the heart of any Wormeley of Rosegill. The dining room corresponds on the left of the lawn entrance to the parlour on the right both in finish and size. The same beautiful panelling, the same dentilled cornice wainscot and chair rail awaken in the appreciative observer deep admiration again. The plaster ceiling has a Victorian frescoed ornamentation. Although the entrance door is plain, the inside door is worthy of the keenest study. The alternating narrow, rectangular panelling and the same arrangement of four that are oblong and of larger size, are so deeply bevelled on each edge that some of their size is taken away, giving to the panels, in consequence, the effect of standing out in relief. The second storey is very much like the first, with, a long hall between the stairways. The floor is finished with the same thought and care as that below. The treatment of the walls and the high ceilings produce, in common with the entire house, an effect of luxurious and comfortable ease. After reaching this floor the stairway continues in cruder fashion to the attic which, without any partitions, is said to be or to have been reserved for bachelor guests. The long river hall presents the uncommon spectacle of a stairway rising from each end. Following the best Colonial standards, the main dwelling stands between the two smaller buildings which have much the appearance of English cottages. Though one may have been school house or office, it is now used as the dairy, but the other until recently has probably always been a kitchen, though the latter-day cookery department was some time ago removed to the east end of the main house. These little buildings are charming in every line. Each has, like the great house, a shingled gable roof, but each has also on both sides dormers with hipped roofs, and chimneys rise from the two ends of each. The dairy has two arch-headed windows containing twenty small panes of glass and arched shutters; on the side round topped windows are used. The original kitchen-forty-eight feet long and twenty-one feet wide-has arched windows, small river portico and quaint dormers, the chief difference in the two outbuildings being the vines which cover the kitchen. The curviform opening is fifteen feet wide and five deep. The antique crane swings as it always did, and into the bricks of the fireplace, which appear rather new, there is set in one corner a stone much worn from sharpening many knives. The mantelshelf and side framing, of course, were not there in Colonial times. Queerly enough, in a building supposed to be devoted to supplying the great house with food, there is a very interesting staircase between the two rooms which leads to the loft. It is said that when Senator Cochran owned Rosegill he used the old kitchen for oyster roasts as famous as any ever held by Ralph Wormeley.